Lucky is a Pit Bull/Cattle Dog mix. He is a sweet and friendly dog, but VERY high energy. 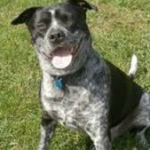 His high energy disposition coupled with the fact that he lacked obedience commands and basic manners, proved to be a challenge for his owners. 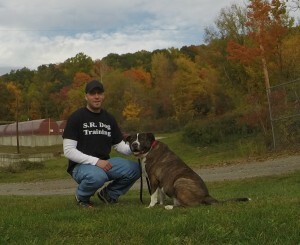 Lucky’s family adopted him from a local shelter two months prior to contacting me for dog training in Chappaqua NY. His owners were struggling with how to stop Lucky from jumping on the couch to bark at the neighbor’s cats, prevent counter surfing (stealing food off the kitchen counter), and how to prevent him from pulling them down the road when on walks. The last issue that sparked them to look for a dog trainer in Chappaqua NY was the fact that he would jump on all guests and family members who enter the home. Needless to say, this was frustrating and stressful for his owners, but also a potential safety issue for elderly individuals and small children. The issues that were stressing Lucky’s owners are not uncommon, I help owners with these similar challenges every day. The first thing we did was teach Lucky how to safely and appropriately greet people. From there, we took him through my complete obedience training program which developed true obedience (listening to his owners regardless of distractions and without the need for treats). Within one week of training, we were able to stop him from jumping on the couch and destroying their living room curtains. In just one training session we transformed what use to be an uncomfortable and stressful walk, into a relaxed and calm experience for both Lucky and his owners. Regardless of what challenges you are facing with your dog or even if you are not in need of dog training in Chappaqua NY, make sure to use a simple, safe, and effective dog training program. It is essential that you use a training system that is based on sound dog training principles, ones that have been proven effective with all dog, regardless of breed, age, or size. 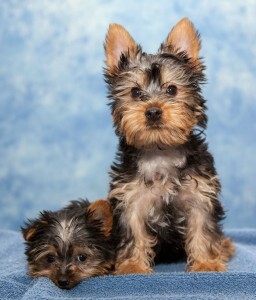 Ted and Max are Yorkie and Silky puppies, both 11 weeks old. Their owners contacted me for Dog Training in Chappaqua NY, so they will be trained the correct way from the start. The greatest contributing factor to a well-behaved adult dog, is early puppy training. Our initial focus for Ted and Max is housebreaking. One of the biggest challenges for new puppy owners is the constant worry of housebreaking accidents. I have a specific housebreaking approach that I use with every puppy client or adult dog who is not fully housebroken. It is extremely effective, provides owners peace of mind, and usually solves all accidents within a couple weeks. Once housebreaking was covered, we wanted to ensure Ted and Max learned to play well together. It is very common for owners to think their dog is playing aggressively, as dogs typically vocalize, growl, and nip during play. I observed their interactions and could confidently reassure their family that at this stage, Max and Ted’s play was normal and healthy. The last aspect of our training together is focusing on obedience training. Taking a proactive approach with training goes a very long way. We are laying a proper foundation of obedience with heel, sit, down, come, and place. These are the basics of the 5 Obedience Commands to Make Your Life Easier. People always tell me, “You have the best job, you get to work with dogs all day.” They’re right, I do have the best job. “Both my husband and son felt your advice was priceless today. Thank you again so much for your direction and expertise! I look forward to when we see you again and I will keep you posted on how the week goes! It’s my privilege to help so many owners live a happier life with their dog.